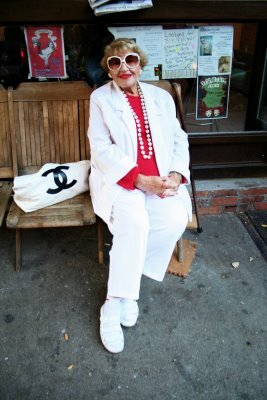 My fashionista daughter in Paris forwarded me a link to Advanced Style, a blog on chic into one’s golden years, or silver years, or wizened years, or something. Thanks for thinking of me and HNTAO, sweetie, though I’m not sure whether to be flattered or insulted by the viewpoint of this blog. On the one hand, gee, it’s nice when someone, anyone, notices that people over 40ish exist, much less applauds them for their superior style. When that applause is public and coming from the Evil Young, it’s truly a breakthrough event. And yet, do I detect a whiff of patronization here? A hint of: Yeah, those silver-headed wizened people, they’ve got individual style, sometimes even chic, but they’re not truly hot and cool like us. I was disappointed not to find a single person on the blog who I aspired to dress like, though I’m always on the lookout for old people style role models. The best one I ever found was an ancient Asian man I spotted on a beach in California, wearing a straw hat, a white shirt, black pants, and brown sandals. Now that’s authentic and eternal chic.